Creating illusions to fool others has been used as a form of entertainment for thousands of years. In movies and photography, an illusion called forced perspective takes advantage of a person’s tendency to make assumptions about the world they see to make objects seem bigger, smaller, closer or further. In the Lord of the Rings for instance, the hobbits were often made to look smaller not through fancy computer renderings, but simply by making the objects around hobbits unusually large and the objects next to non-hobbits unusually small, and by placing the actor further away. These manipulations have the effect of changing the apparent size of the actor, because the viewer assumes the nearby objects e.g. chairs, are of a size the actor can use, or that the actor is next to them, when in fact they might be far behind. Bowerbirds, a species native to Australia, New Guinea and the surrounding islands, may also create such illusions with the intention of securing a mate. Male Great Bowerbirds create a large hall of twigs called a bower, through which a female watches their courtship display to decide if she wants to mate with the male or not. The male creates a court outside of the exit of the bower where she will view him, and arranges objects (such as pebbles, shells and bones) from small to large. This gradient creates a forced perspective illusion, as the male bowerbird and his decorations will appear closer, and thus appear larger and with movements that seem to cover more space than they actually do (Disneyland also uses the same illusion to make streets appear longer, and buildings and castles appear taller). Leibovitz, Annie (n.d.). 50 Brilliant Forced Perspective Photography Examples. Webneel.com. Positioning of the camera and actor make it seem as if the person is as tall as the building..
A bowerbird bower and court. Endler, Endler and Doerr 2010, Current Biology. In the left image, the rocks are arranged small to large, and in the right, large to small. Notice the difference in appearance from the female’s perspective. Of course, it may also turn out that the birds simply do it because the presence of a more regular pattern is less distracting to the female, thus focusing attention on the male and making their dance more conspicuous. For Wilson's bird of paradise, this seems to be the case. These birds clear the leaves off a patch of land seemingly to make sure that clears a patch of land of leaves seemingly so that their green coloration may be more obvious during their dance. In a recent paper, Kelley et. al. have shown that it might be the forced perspective illusion itself that the birds are creating, and not a simple stage upon which to perform. The group studied the bowers of Great Bowerbirds in the wilds of Queensland Australia at Dreghorn Station, and found a positive correlation between gradient slope and mating success. When the researchers reversed the gradient, the birds moved the objects back. When the researchers moved the objects out of the court completely, the birds rebuilt the gradient. No relationship was found to exist between location and the amount the steepness of the gradient varied by, suggesting that the birds sought out appropriately sized items for their court. When rebuilding their gradients, birds searched through the objects to find the sizes they needed, re-establishing visible gradients within the first ten or so items. While this seems very exciting, the effect sizes were somewhat small. Many other variables that are strongly correlated with mating success in bowers and related species were not accounted for, such as bower symmetry, number of decorations, bower quality, and bower stick diameter, meaning that what was seen might actually be a spurious correlation that disappears when considered along with these other variables. The objects might also be arranged in increasing size because of the way the bird dances. Having the larger objects placed further away might ease their steps. Choosing them in the first place might be necessary as a part of their courtship display. Furthermore, if the severity of the gradient is increased, the birds return it to its original values, ruling out the strength of the gradient, and of the corresponding illusion, as the only important factor. It may be that if the gradient becomes too severe, an equal viewing angle for all objects is not maintained. Since each bird has its own decorations, it may be that they want to maintain viewing angles for their decorative objects, which would explain why each bird has its own gradient. Objects are also chosen for their white or light color, which allows ornaments to stand out, and simply providing an even background through the gradient arrangement might allow their ornaments to stand out even more by reducing visual distraction. It may be that when taken into account with all of the other mating variables, each bird has an optimal gradient. Indeed, when their courts are cleared and the birds are given the objects from another’s bower, they recreate the gradient they previously had, not the donor’s gradient. Perhaps it is a combination of all of these things. Future work will need to study these birds over many years, as well as their parents, to see if this behavior is learned or innate. It would also be nice to see if females can perceive the gradient, by training the, on a pecking task to discern which object is closest on two competing screens, where a gradient with an object placed upon it would be displayed. For the time being, we have a very cool behavior with some preliminary data. Hopefully future work will tell us definitively what these birds are up to, and if they really can consider how the illusory effect they are creating will be perceived from a specific viewing point, and use that knowledge to optimally design their courts. Kelley, Laura A., and John A. Endler. 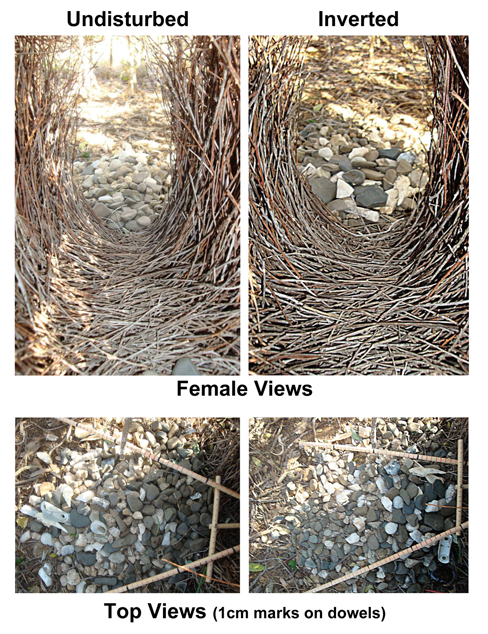 “How Do Great Bowerbirds Construct Perspective Illusions?” Royal Society Open Science 4, no. 1 (January 18, 2017). https://doi.org/10.1098/rsos.160661. Great Bowerbird cover image: Jim Bendon, Flickr.